Directors: Elizabeth Chai Vasarhelyi and Jimmy Chin. 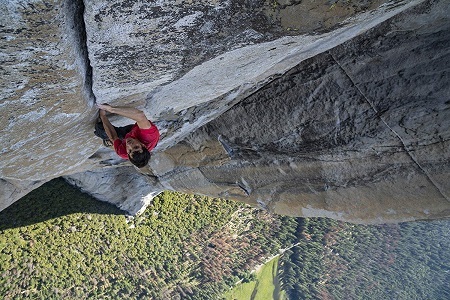 Documentary about Alex Honnold's dogged attempts to climb the 3,000-foot face of a rock wall in Yosemite National Park, without ropes, nets, or harnesses. Interview subjects include Alex Honnold, Sanni McCandless, Tommy Caldwell, Jimmy Chin, and Mikey Schaefer. Twitter Capsule: Man on Wire, but with no wire. At once sympathetic and tough. Digs into relationships, monomanias, feelings about death. VOR: ③ It's remarkable that the crew secured this footage, and took thoughtful stock of the burden of their own presence. Formally familiar in other ways.